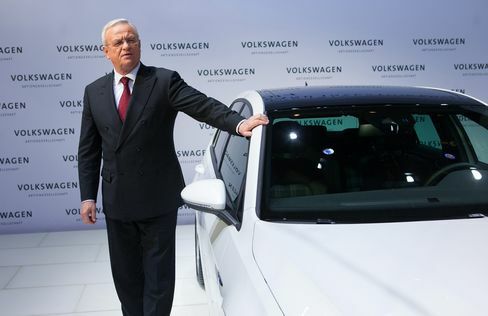 Volkswagen AG Chief Executive Officer Martin Winterkorn was preparing to build the Passat at a new $1 billion U.S. factory and was not pleased. The shares, which lost 19 percent on Monday, continued to tumble Tuesday, falling as much as 6.7 percent to 123.40 euros in Frankfurt trading. The stock has now dropped 33 percent this year, valuing the automaker at 59.6 billion euros ($66.6 billion). Volkswagen executives convened by phone over the weekend to discuss the so-called defeat device uncovered by clean-air researchers. In a tense exchange, blame was passed around, but no one asked Winterkorn whether he knew about the software, according to a person familiar with the conversation, who asked not to be identified because the talks were private. The cars targeted by the EPA’s probe include VW and Audi vehicles for model years 2009 to 2015. VW halted sales of those cars in the U.S. on Sunday as it grappled with the fallout of the scandal.